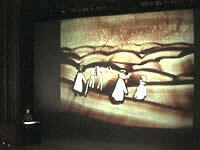 Sand animator David Myriam perform a special performance of Dunes at JCC Carthage festival, Tunis, a festival for arab, African films and from other countries. This 08 minutes show has been performed at « Colisée » Theater, during the evening of Festival opening. The theater was packed with more than 3000 enthusiastic people. The film “Indigènes” was projected in opening after.